This city also has a rich history although you have to search for it to find some evidence. 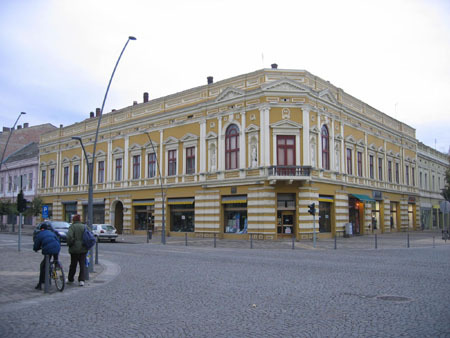 Sabac was heavily damaged during the second world war and after this modern reconstruction started which shaped Sabac to what it is today. 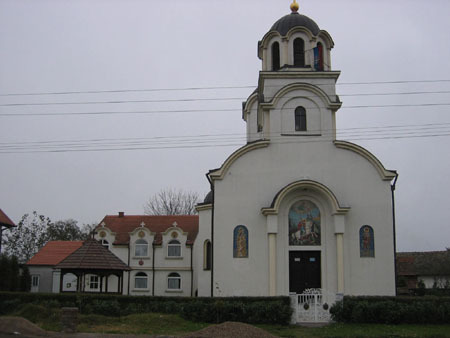 An industrial city located at the banks of the river Sava. 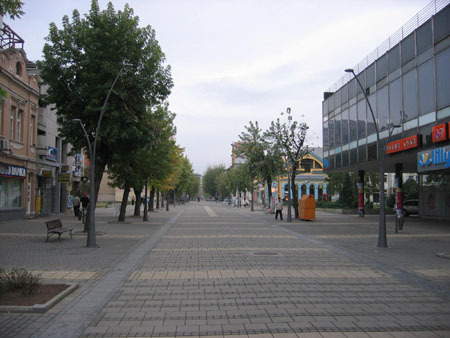 Sabac, with a population of more than 55.000 people looks quiet on a rainy Sunday afternoon. Just like Smederevo, which we also visited this weekend, the first thing we noticed is another US Steel owned factory. Those factories are certainly dominant and like in Smederevo located very close to the city center. 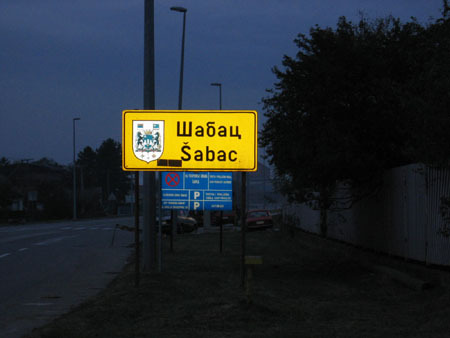 The easiest way to get in Sabac is to take the highway from Belgrade to Zagreb. After 56 kilometers you will find the right exit. A nice country road leads you to the city. On our way we saw this church with some nice fresco's on the front. 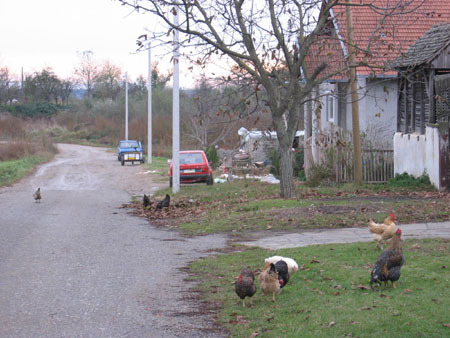 A couple of chickens added to the country feeling. 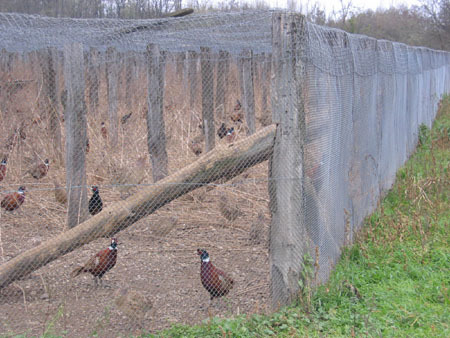 A little bit further and some 500 meters of the main road we also discovered a Pheasant farm. I asked a guy if they were kept for sale and consumption like chickens. He explained that they were kept for hunting purposes. In the woods around the farm you can release them and hunt them before taking them home for diner. Back to Sabac and the history of this city. Records dating back to 1454 mention it as Zaslon. The Ottomans took possesion of the city around 1470 and made fortifications. The name of Zaslon was changed into Bejerdelen (that which strikes from the side). Like with many other cities in this region the Austrians and Ottomans had some fierce battles and the ownership of the city changed several times. Some remains of the fortress are still visible nowadays. 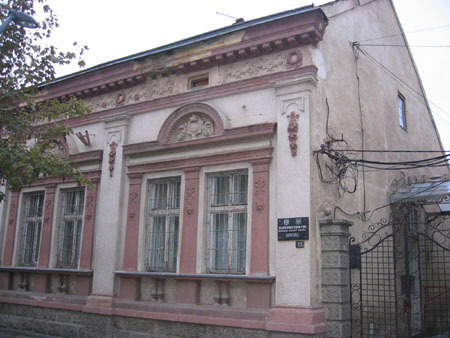 In 1883 the first (Serbian) newspaper was printed here and it was also the first city where women were allowed to start visiting coffeeshops. Novi Sad has it's famous Exit festival but Sabac also has a summer festival. Unfortunately their website is only availabe in Serbian language but maybe that will change soon. On the other hand, we are not sure about this. Look at this picture of the local tourist office. 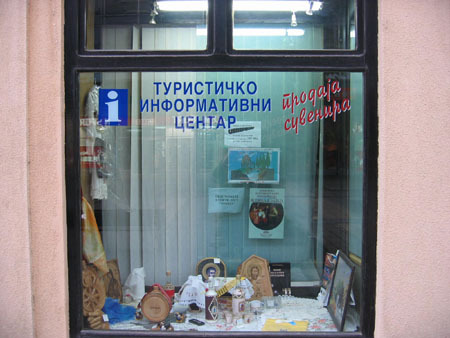 We can read cyrillic so we recognised it as the tourist office. How can you attract international tourists if you are not prepared by offering English services? We walked through a nice pedestrian zone and there we bumped into one part of a wedding ceremony at a church. The music immediately reminded me of the music I heard when visiting the official Guca trumpeteer festival website. Check the movie I made with my digital camera. We also noticed that upon arriving the bride was still smoking cigarettes in the back of the car. It would not be Serbia if they would not smoke everywhere. From Sabac we took the provincial road to Obrenovac. A nice road like the road from Smederevo to Belgrade. Instead of the Danube (Donau) on our right side we could see the Sava on our left side. One tricky thing of driving in the dark in Serbia. Tractors, people on bikes and by foot being hardly visible on those very dark roads. Look out if you drive when dark. But now the funny part. Police stopped me and asked me to switch of my lower 'fog' lights because this was not allowed for some strange reason. On the one hand they do not bother about those tractors and other dangerous things with no lights at all but they bother telling me to switch of some of that disturbing safe light, hahaha.